When I was in OH, I was also inspired by Tammy Hershberger's acetate card class and decided that I'd love to offer the same type of class at Wholly Scrap! This is the first card I created for the class. 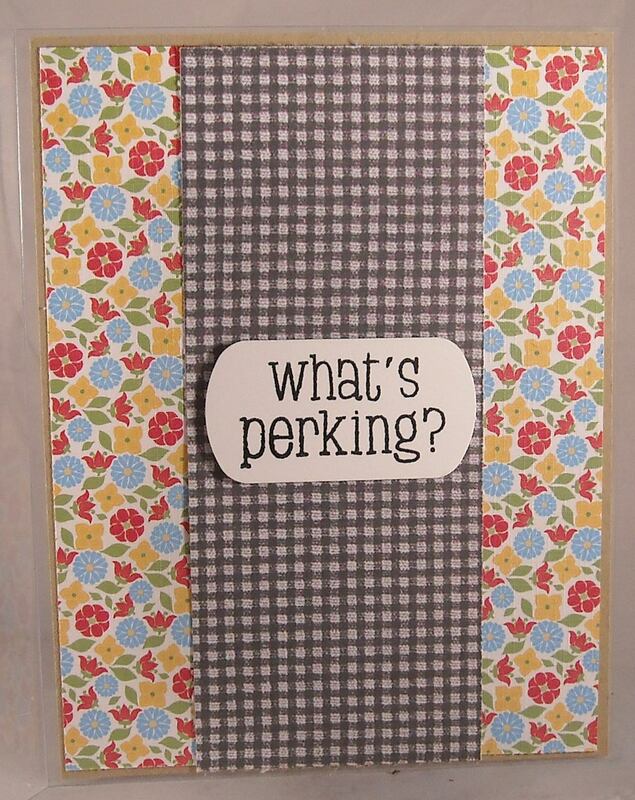 I used the What's Perking stamp set for this card 'cause I love all things coffee! 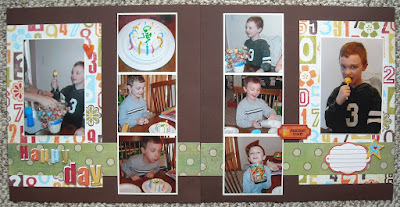 I stamped the images on kraft and opted to not color (shocking!) but I love the look of the plain black lines on the craft cardstock. The designer paper is from GCD Studios, the pre-folded acetate cards are from Hero Arts (I purchased mine from Toyrifix). 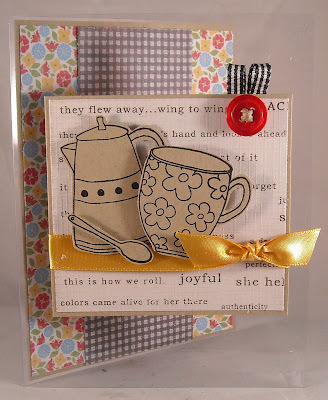 The gold ribbon is from Papertreyink and the gingham is from SU! And since we're playing with acetate it makes perfect sense to also decorate the inside of the card, which is where my fun sentiment is located! Enjoy and have yourself a big 'ol cup of coffee today!! 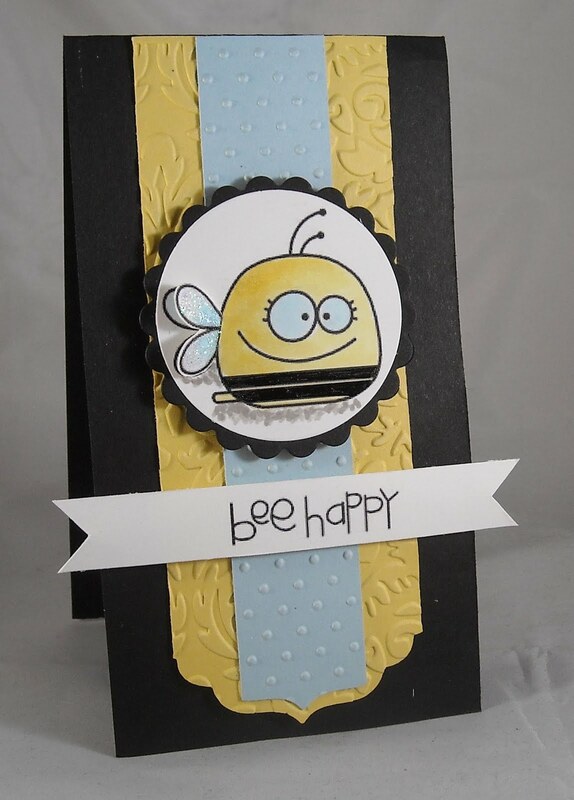 Pssst....I have a card posted on the Sweet 'n Sassy blog today! Check out all of the details here! Happy Saturday friends! Is everyone enjoying at least a small break from the insane heat this weekend? Today when I walked outside, I was met with cooler temps, which is a blessed relief from the past few days of over 100 degrees! Strange weather for the Northeast! Today I'm sharing a card that I created for a friend of mine that had a stressful week...Sometimes just knowing that you're loved and someone is praying for you brings some comfort. 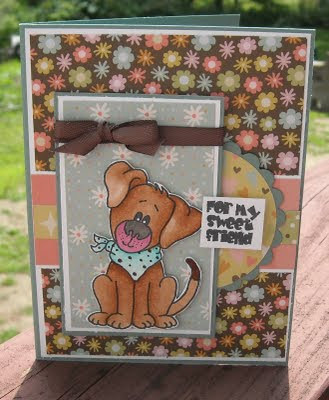 And since my friend has a thing for cute little puppies, I had to use this darling Sweet 'n Sassy stamp set, Woof You. Enjoy and have a blessed weekend!! Remember the Stamping Around event in OH? Remember that it was hosted by a great toy/stamping store called Toyrifix? And remember that I came home with far too many new stamps, dies, and other goodies? Well I'm finally pulling those new goods out of their bags, where they have been living for the past month, and made a card for the Toyrifix challenge (you can check it out here). Today's card, which was made for a brand new high school grad from our church, was created using the super cute Cat's Pajamas stamp set, Away We Go. I love these bunny images...those ears...so huge and fabulous! And how about those clouds? I'm finally jumping on the shaped die bandwagon and since Toyrifix was carrying all kind of fun dies, I had to purchase a few! The cloud die is called Cloud Border and it's also from The Cat's Pajamas. My designer paper is from Echo Park. Enjoy and remember...The sky is the limit! Bee Happy - Use Paper Smooches Stamps!! When we were at Stamping Around in OH, Julie told me about Paper Smooches stamps. I said, "sounds interesting." And then she showed me the Paper Smooches stamps and I said, "AHHHH!!! I need them!!!" Seriously, these are some darling stamps and I can't wait to place an order! 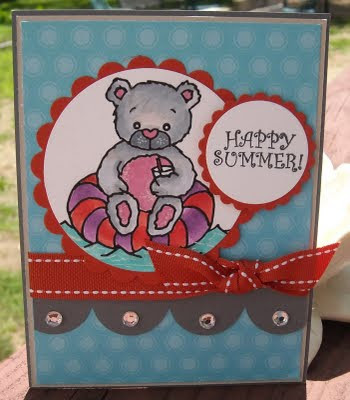 This was a pretty straight forward design and I actually used scraps to make the card. Love when that happens! The card size is more narrow than a standard card, only about 3.5" wide. I ran two pieces of cardstock through the Big Shot, using two different embossing folders. Such a great way to add dimension and design to cards, without a lot of work. I did add an extra set of wings, covered with glitter of course, and colored the stripes with a gel pen so they're nice and shiney (wish there was a good way to photograph that shine!!). The sentiment was made in to a paper ribbon and attached with foam tape. 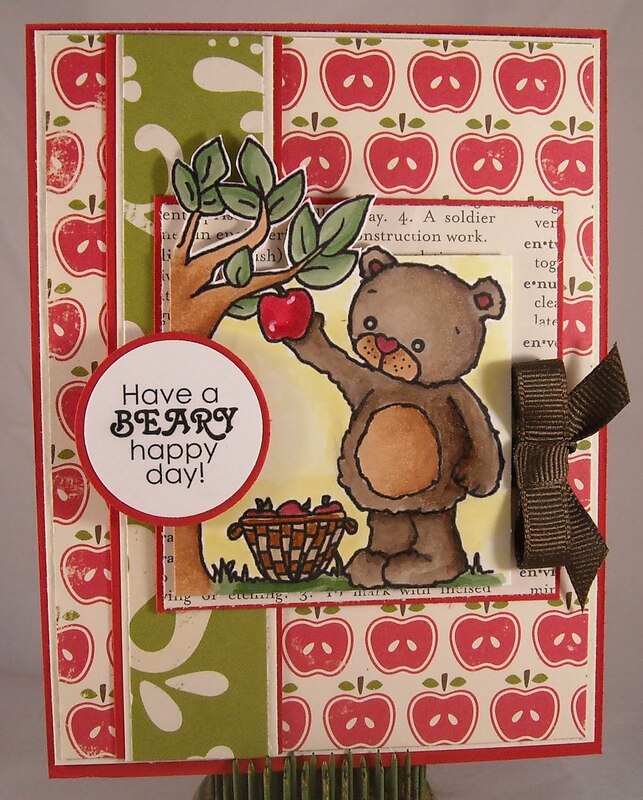 Enjoy today's card and go check out Paper Smooches web site, you'll love their stuff! Welcome to the next Rhubarb sneak peek!! Have you been following along with this week's amazing Rhubarb designs? A new image has been released on the Sweet 'n Sassy web site each day for the past week...and there's still more so be sure to check on the SNSS site each day!! 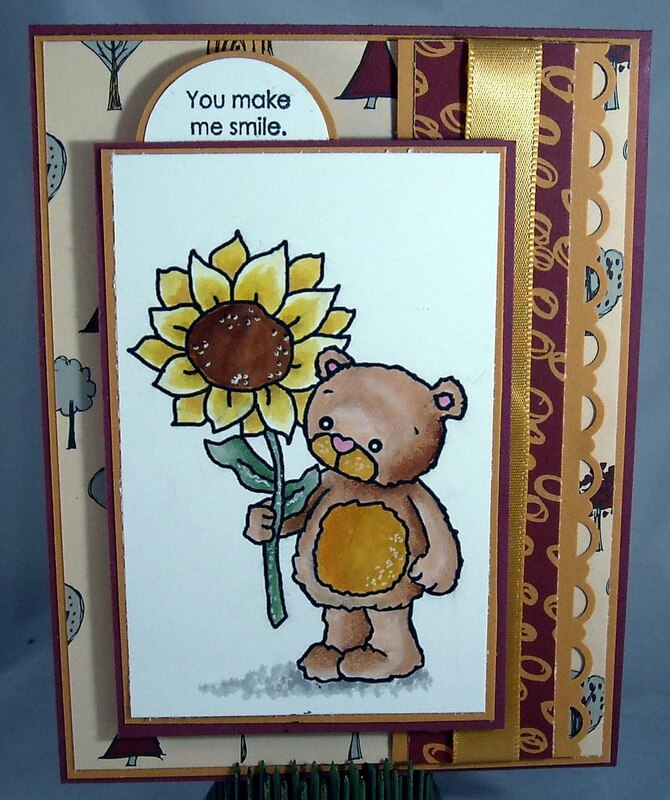 My card is showcasing the Rhubarb's Sunflower image...isn't it adorable? I love the giant sunflower. I colored the image with Copics and paired the image with designer paper from Niki Silvis. The layout started out as this week's Sweet Stop layout but I ended up leaving off a layer...no room! :-) I do love the sentiment on the half circle at the top of the image. The sentiment is from the Seeing Spots stamp set. Enjoy today's image and card and have a lovely weekend!! Introducing Sweet 'n Sassy's newest darling digi creation - Rhubarb!! The cutest little teddy bear ever!! All this week Korin has been showcasing a number of new Rhubarb images...Saturday I'll have a new image and card to share! Today I'm showing off the Rhubarb Enjoys the Pool digi image, which is perfect for us as we just purchased a new pool for the kids! I colored the image with Copic markers and added lots of scallops! The layout is from this week's Mojo Monday challenge. Just a piece of ribbon (Papertreyink) and rhineshone embellishments to finish off my card! Enjoy and be sure to stop by the SNSS web site to see all of the images that have been released so far...there are more to come!! On to those scrapbook pages! The first page, which I think we'll actually turn in to four because I had so many photos from Bean's birthday party, are of our oldest's birthday party. The title page is below. I'm drawing a complete blank for the name of this designer paper and I used up every square inch of what I had. However, this was a birthday specific paper line so I was able to also pick up a sheet of cardstock stickers, perfect for embellishments! I used all of the papers in the backbround and only added a yellow scalloped piece of paper and a piece of cork (that's fun!). I used stickers for the embellies and buttons from Papertreyink. The letters are from Tim Holtz and I colored them brown with Distress Ink. Here are the other two pages. Very simple layout and these were actually pages that I demonstrated at a Wholly Scrap! 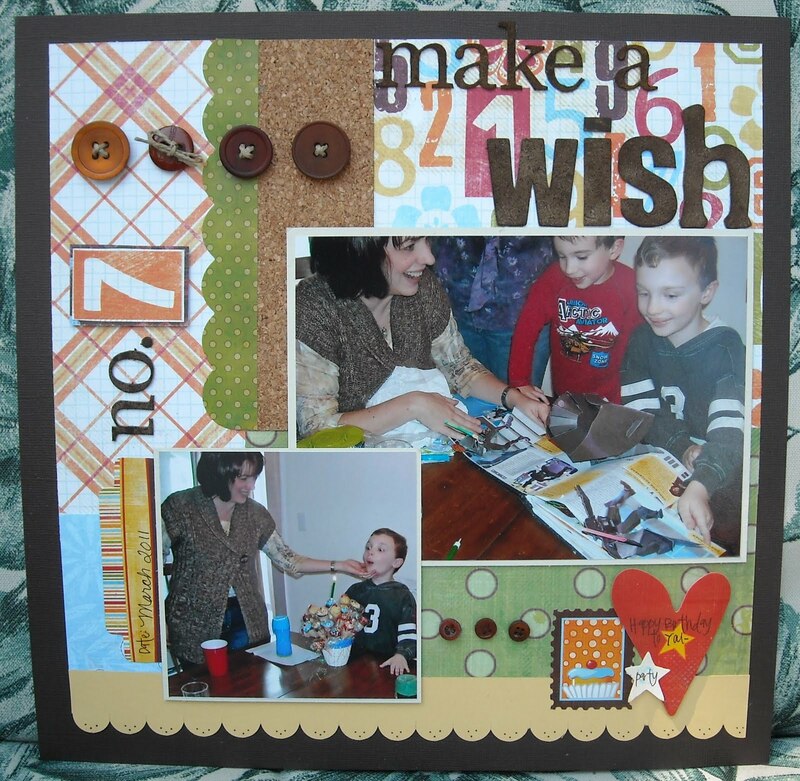 beginner scrapbooking class last year. It was great to just add photos and a few stickers. I still need to add the journaling but I was a woman on a mission Saturday and had no time to stop for journaling! Something I need to add asap!! That's how I spent my weekend, what did you do? A few days ago I was looking through some of the Splitcoast galleries and I came across a card where the creator said she made a "long and lean" card. I loved that description and the layout so a few ago as I was putting away a bunch of paper scraps I came across a few "long and lean" scraps and knew I had to turn them in to a card! All of the pieces of this card are from my scrap pile! The designer paper is from Jillibean Soup. The dark green design was exactly that size and all I had to cut was the orange background paper...love when that happens with scraps! The text image is from SU! and the darling tulip image is from the Spring Tulips stamp set from Sweet 'n Sassy. The ribbon is from Papertreyink. I know there are some big 'ol shadows on this photo but I like that you can see the dimension of the flowers from mounting that image with foam tape. 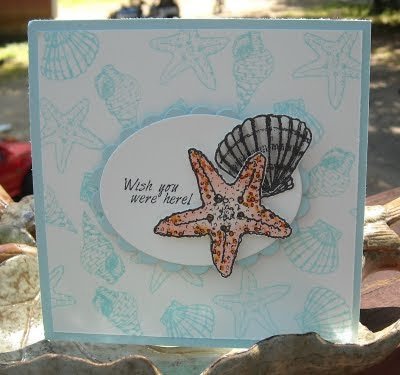 Today's card features images from a recently released Sweet 'n Sassy stamp set, Beauty by the Sea. 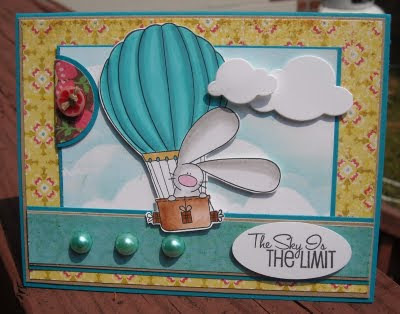 This is a card that I'll be demonstrating during a Wholly Scrap! class later this week. 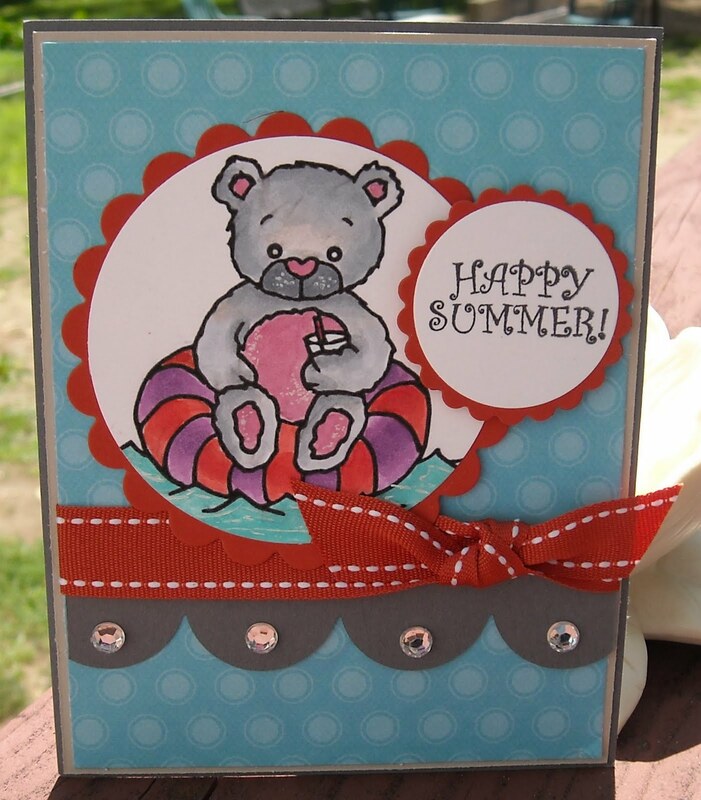 The class is focused on creating a set of CAS cards using this set and the Happy Ocean Friends set. I'm looking forward to playing with these great sea-inspired stamps!! To make the background of this card I grabbed a large acrylic block and attached the large shells stamps to the block...instant background stamp! The ink color is Tumbled Glass from Ranger. I then stamped two shells on cardstock, colored them with Copics, cut them out and attached them to the oval with foam tape. A perfect CAS card layout!! ETA: I failed to member a great new challenge blog a friend of mine told me about...The Birthday Sundaes challenge blog! It's a blog dedicated to birthday-themed challenge, fun!! Head on over and check out this week's challenge!! Happy July 4th weekend to everyone! Hope you're all enjoying some time off from work and are taking some time to relax with friends and family! We're headed to a local town parade and then off to a BBQ, where we plan to ingest large quantities of meat and sweets! 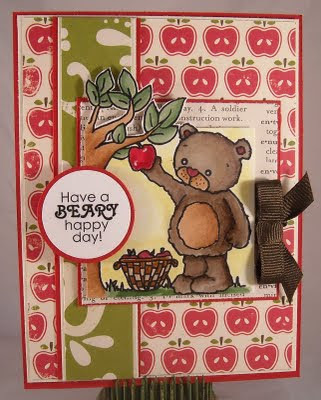 :-) Today's card is perfect for a Keep it Simple post and this simple card only took me two evenings to complete! Don't you just hate when that happens? Some nights I just stare at a pile of paper and stamps and can't seem to come up with a thing. So...I walk away. I came back to the studio last night and had this card completed in about five minutes!! (Even with learning how to use my brand new Bow Easy, which was given to me by a dear crafty friend! And...I LOVE it!!) 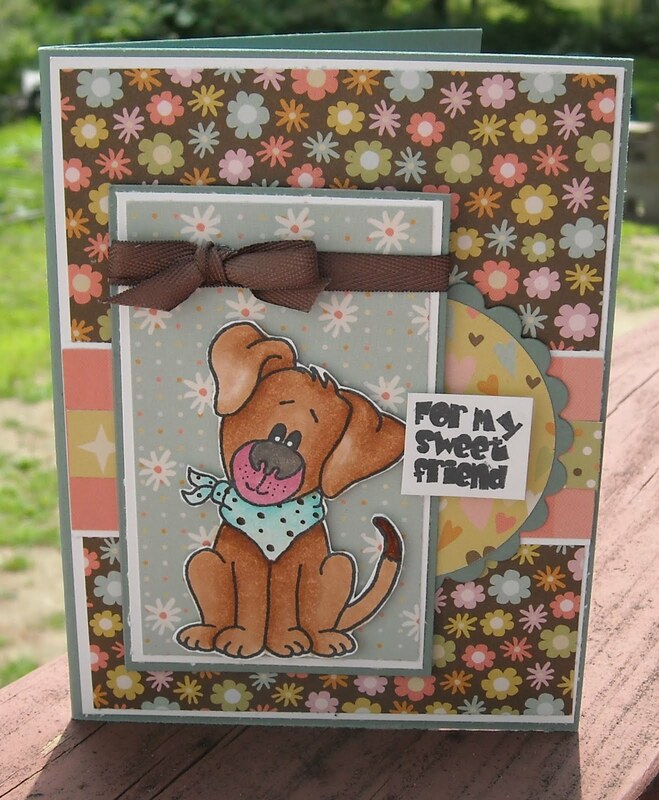 My card features a brand new image from the newly release Seeing Spots stamp set from Sweet 'n Sassy. Love this set, there are literally hundreds of options with these darling round images. 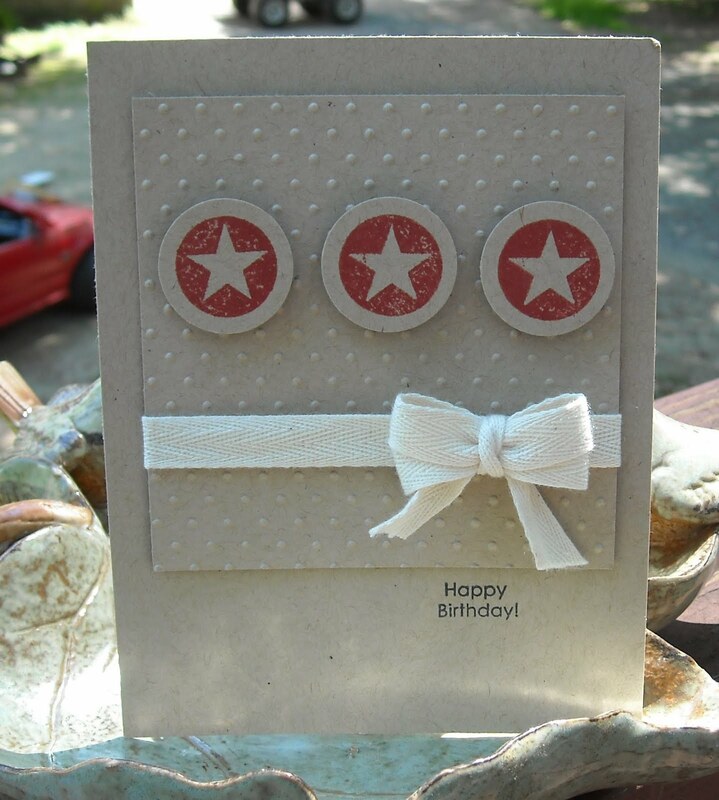 I stamped the star three times and punched out the images with a 1" circle punch. I embossed a 3.5" square of kraft cardstock to showcase the mini stars, and I added a piece of twill (check out that fabulous bow...thanks to Bow Easy!) to the embossed cardstock. A little happy birthday sentiment - sent out to our great country on this holiday weekend - finished off this CAS card. Enjoy!